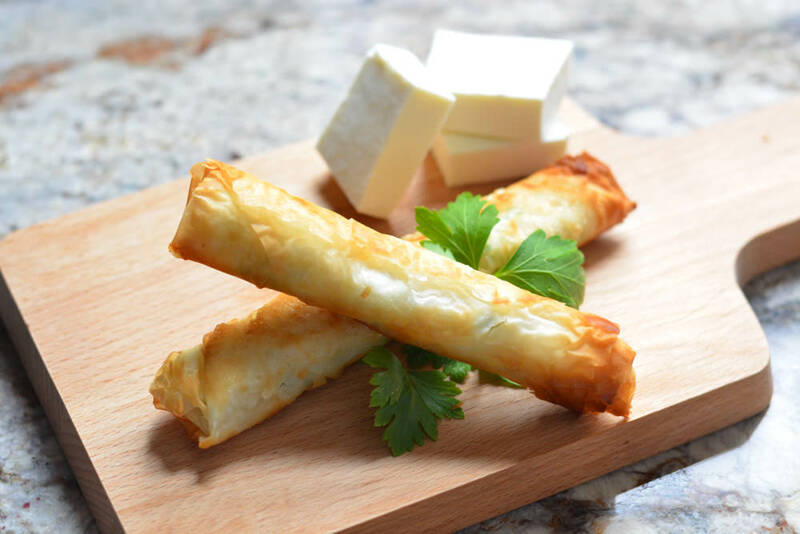 Cheese rolls are nothing new to the appetizer world, but what distinguishes the Lebanese version is the type of cheese and dough used. Unlike most of the recipes I have shared with you so far, this is not a dish that I technically grew up eating at home, but, rather one that I would always eat in restaurants in Lebanon during my visits. This is a well-known ‘Mezze’, or appetizer, served right along with hummus, baba ganoush and fried kibbe. I remember me and my siblings would always fight over the last one, especially my cheese-obsessed brother. They are just that hard to resist! These are also one of the most popular appetizers made during Ramadan. Cheese rolls are nothing new to the appetizer world, but what distinguishes the Lebanese version is the type of cheese and dough used. The cheese used is ‘akawi’, which is a firm salty white cheese famous throughout Lebanon. I buy mine from my local middle-eastern grocer. If you find the cheese to be too salty for your liking, before you shred it, soak it in a bowl of water for 20 minutes to remove some salt and brine. If you cannot find this cheese, you can use another white cheese such as queso blanco, or even mozzarella. Both substitutes are mild in taste so, you would need to add to salt or use a natural saltier option like feta or halloumi. The dough in this recipe, is so thin and when fried, so crispy! Yes, you guessed it, Phyllo is culprit. Phyllo dough is most known for its use in baklava. It is stored in the freezer so you will need to let is defrost at room temperature for about an hour before using. It also dries up pretty quickly, so cover with a damp towel or paper towels while you are preparing them. Recipe is below. I really hope you enjoy this Lebanese version of a mozzarella/cheese roll as much as I do!